What the heck is Wild Bunch? 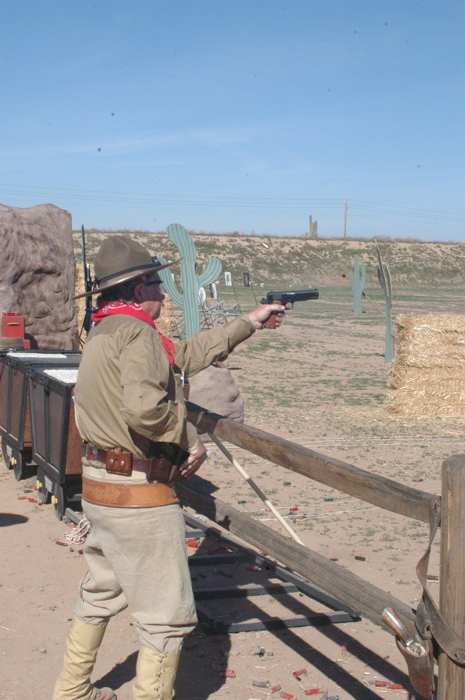 "SASS Wild Bunch Action Shooting is a multifaceted amateur shooting sport in which contestants compete with firearms typical of those used in the taming of the Old West just after the turn of the 20th century: 1911 semi-auto pistols, lever action rifles, and 1897 pump shotguns. 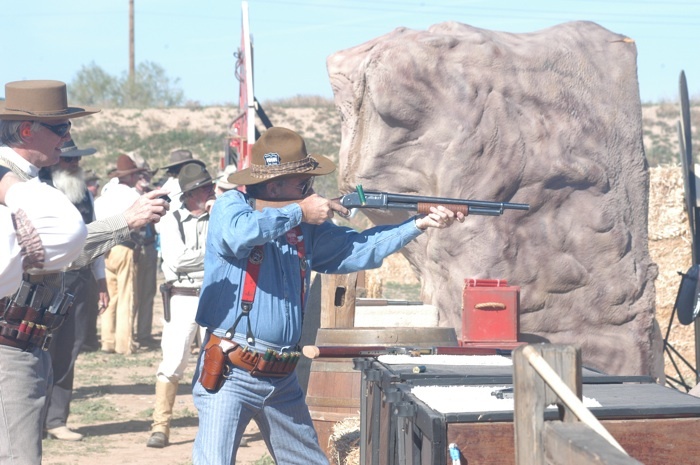 The shooting competition is staged in a unique, characterized, Old West style. 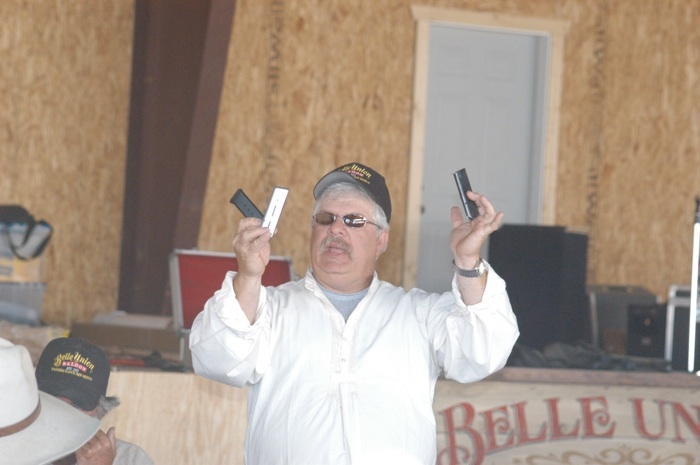 Contestants shoot in several one-to-three gun stages (courses of fire) in which they engage steel and/or cardboard targets. Scoring is based on accuracy and speed. 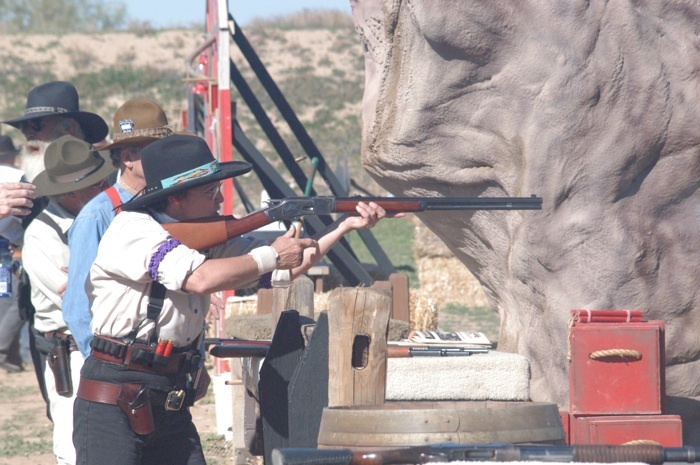 The truly unique aspect of SASS Wild Bunch Action Shooting™ is the requirement placed on authentic period or western screen dress." This series concerns events run under those rules. If in doubt, consult the handbook. Material enclosed in quotes (" ") is from the handbook unless otherwise attributed. "Full size single stack steel frame 1911 style semi-auto pistol in .45 ACP caliber." There are a LOT of 1911 variants. Only certain ones are allowed. 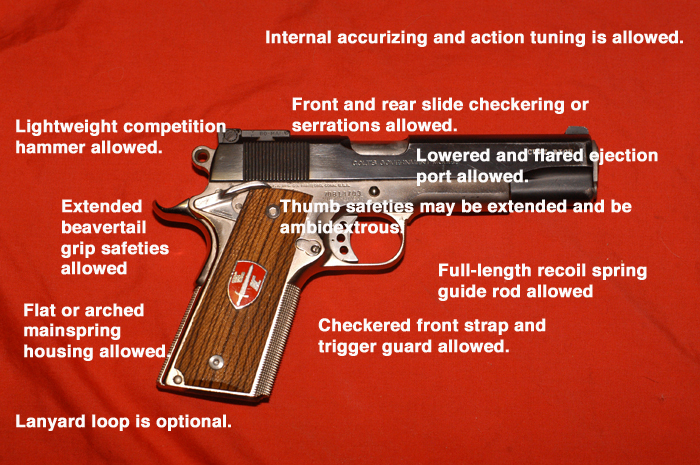 "• Only traditional style pistols are allowed. racking slide, and in case of malfunctions. • Any legal rifle or shotgun may be used. using any shooting style, and so forth." UPDATE 2010--Mainspring housing may be serrated, smooth, or checkered. No one warned Colt that 3 dot sights would be illegal in SASS Wild Bunch matches, and they made some Government Models with 3 white dot sights. Springfield made some Mil-Specs with 3 white dot sights. If you have one of these guns, keep a black Sharpie in your ammo box. 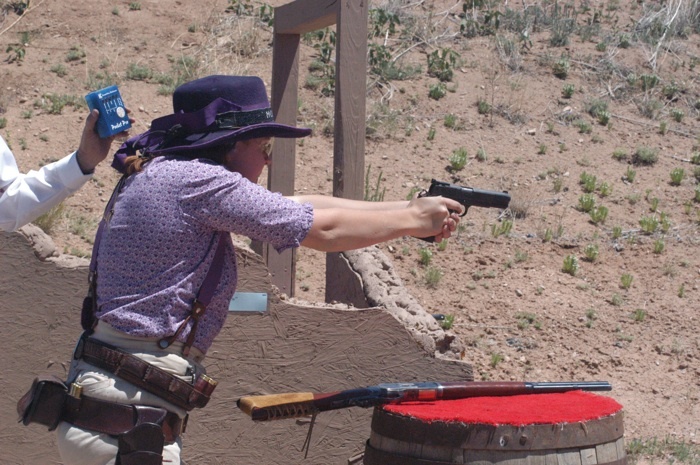 "• Modern and Traditional style pistols are allowed. • May be shot in any shooting style. • Any legal rifle or shotgun may be used." Update 2010--wrap arround grips not allowed. Nothing can cover the front strap. If you use Pachmayr wrap-around grips, you may cut off the wrap-around portion and use the rubber grip panels. Just because things are allowed doesn't make them desirable. Recoil Spring Guide Rods are sold to make money for gunsmiths. They serve no purpose. They can, in fact, be a proglem. Let's say you have an oversized round, and the slide has almost closed on it. You can't open the slide by hand, and you can't slam it closed. You've just bloodied the heel of your weak hand proving it. But there's a window frame. Just put the recoil spring plug against a corner and shove the gun forward, ejecting the defective round and loading the next one. Oh, you have a recoil spring guide? Just lay the gun down and take 16 misses for the stage. No problem. Six inch barrels are legal in Modern. If you have one that is otherwise legal, by all means shoot it. But don't buy one. They recoil more than 5" guns and are less handy. 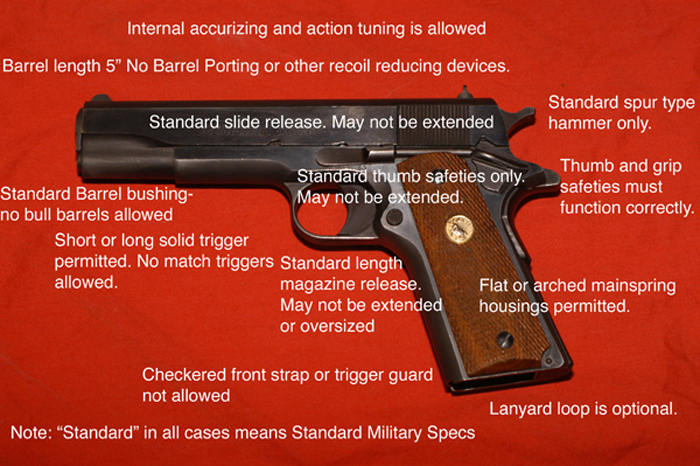 For 1911s, 5" is the perfect number. 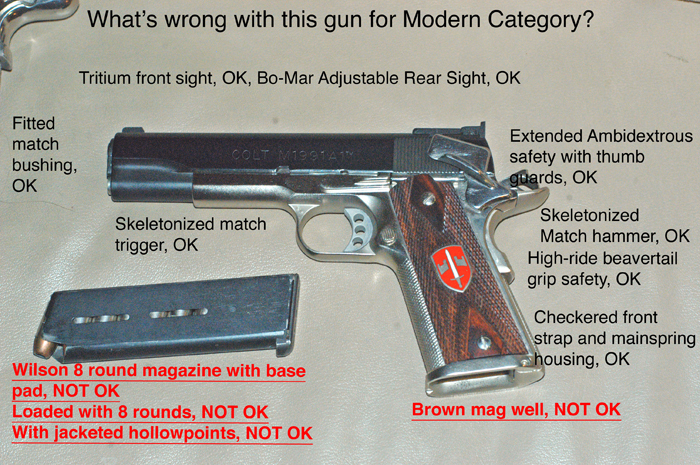 Checkering the trigger guard is worthless. It was popular in the 70s when Ray Chapman was telling us to put our weak hand trigger finger over it to control recoil. Then Jeff Cooper told us not to do that, but to wrap your weak hand around the bottom three fingers of the shooting hand. Rob Leatham taught the same thing with his modified isosceles that dominates competition today. Trust me. The first time you slam a magazine home on a gun with a lanyard loop, you'll have it up for sale the next day. If you want to use one because it's authentic to the period, go right ahead. Extended slide releases usually don't work. The extra weight makes them bounce, letting the slide close or leaving it open in mid-string. If you're right handed and can't reach it with your thumb, use your left thumb. Traditional category: "Grips must be GI-style wood or plastic grips. Other natural materials are allowed but no rubber grips. No target style or thumb rests allowed." 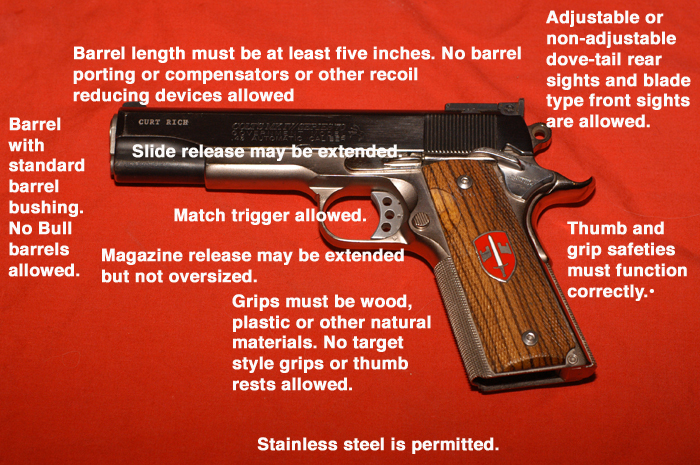 It should be noted that the Colt 1991A1 in stainless steel (O1091), an otherwise outstanding choice for Traditional category, comes with "checkered rubber composite" grips. These have been tried and found wanting, and the shooter with them was moved to Modern category. Some checkered walnut grips would cure that. The blued 1991A1 (01991) comes with double diamond rosewood grips, and they're legal. The 1991s have come in various forms, and some blued ones have had the rubber grips. Modern category: "Grips must be wood, plastic or other natural materials. 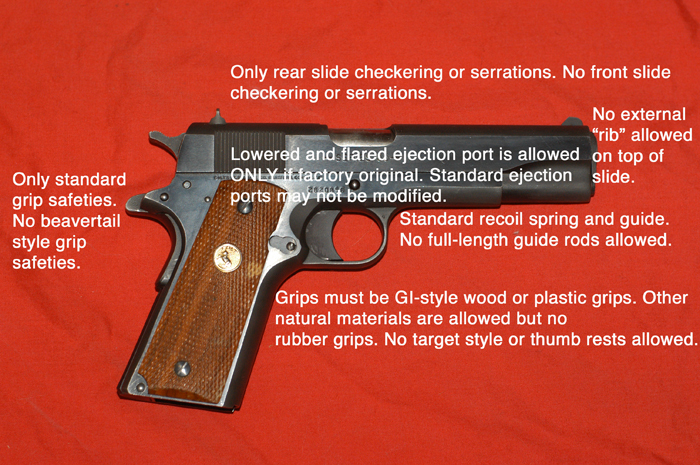 No target style grips or thumb rests allowed." 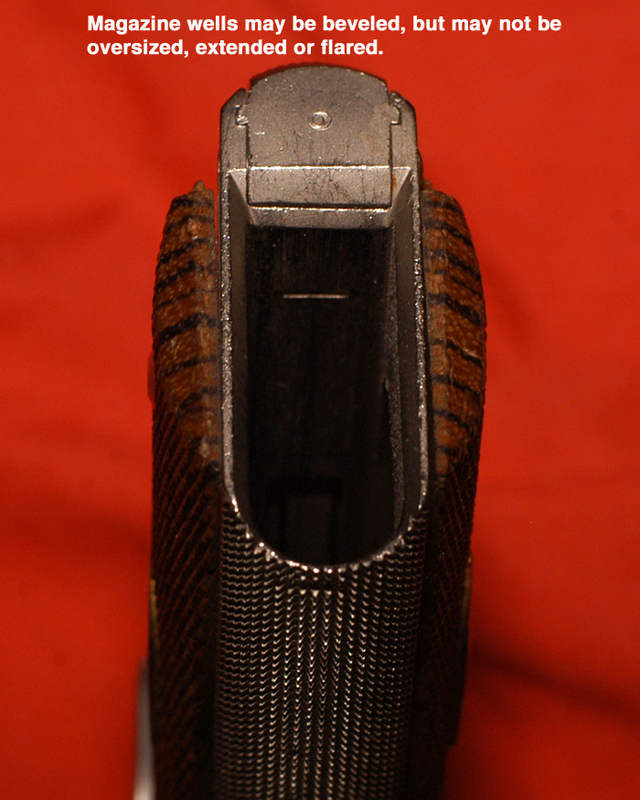 In Modern category Pachmayr wrap around rubber grips with finger grooves in front are not allowed. Pachmayr wrap around rubber grips with checkering in front are (NOT-2010) allowed. Pachmayr rubber side panels with wrap around portion cut off are allowed. 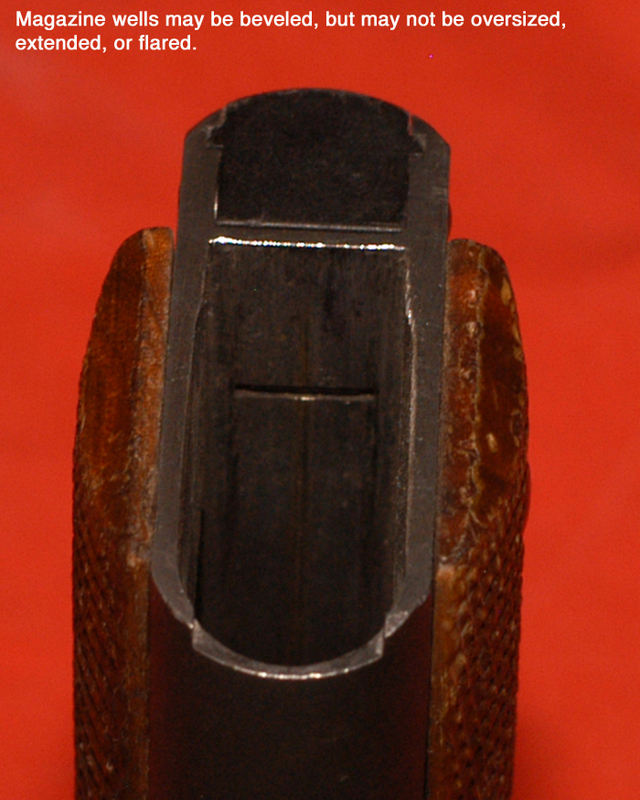 Tex's Modern category 1911 has Pachmayr rubber grip panels. These are the Pachmayrs with no palm swells. These are legal used like this for Modern category only. If you are looking for functional grips, wood with sharp checkering is the most efficient for controlling the recoil of the 1911. Obviously ivory or ivory plastic, etc., with sharp checkering will do as well. Smooth grips might look great, and if that's what you're looking for instead of what is most efficient for shooting, then go for it, but when the gun flies out of your hand when shooting in the rain, don't blame me. 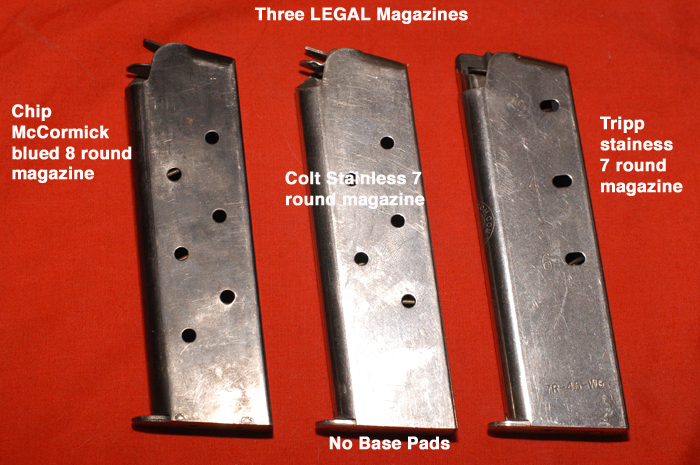 In BOTH categories: "Magazines must be standard length and cannot hold more than eight rounds. No extended base pads on magazines." These, of course, are not the only magazines that are legal. 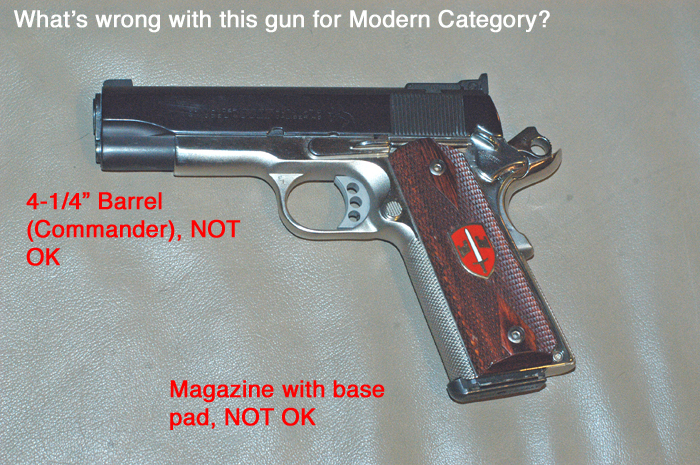 If it fits flush with the bottom of the magazine well and has a welded on, flat base, it's probably legal. There is no reason to get an 8 round magazine since no more than 5 rounds can be loaded in a magazine for Wild Bunch matches. 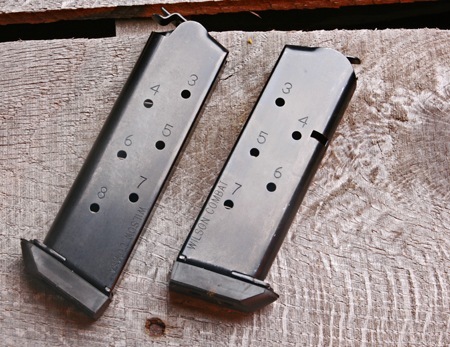 7 round magazines, in general, are more likely to lock the slide back. All reloads must be from slide lock. These are not the only illegal magasines. 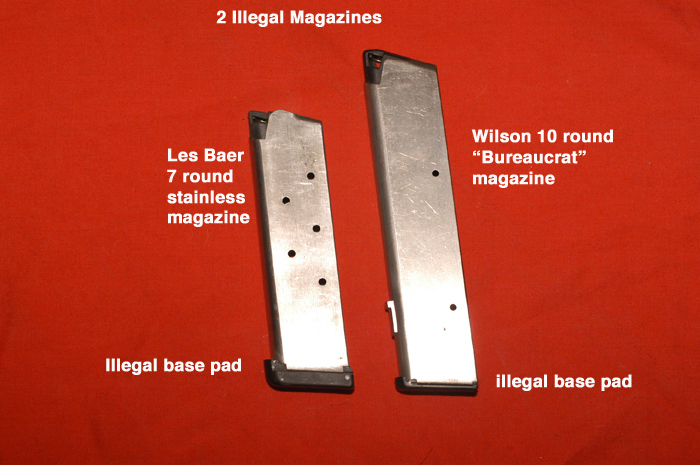 EVERY Wilson magazine except the SERVICE magazine is illegal. Every base pad is illegal, whether it is a glued on piece of leather or a screwed on rubber pad or a Wilson or Baer slide on pad, whether thin steel or thick rubber. The important words are"Base Pads," not "extended." SASS considers them all extended. I'm overemphasizing this because constantly on the SASS Wire someone is recommending Wilson magazines for Wild Bunch, and people are showing up with them at matches. At least one person took the pads off, leaving a precarious little spacer on the bottom of the magazine that needed to be glued in place to prevent it coming off. The shooter learned that without that extension lip on the front of the magazine, it's hard to get a stuck magazine out. 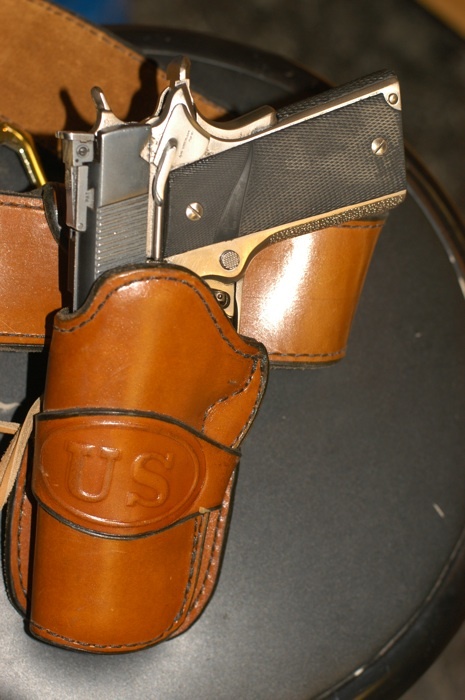 Wilsons are my first choice for carry, but not for SASS Wild Bunch matches. Main match rifles are used, subject to the same rules as in all SASS main matches, with one catch: They must be .40 caliber or larger. They are used just like in a regular match, but you can't shoot a .40+ caliber rifle making a 150 power factor (more about that later) like you can a .38 special shooting a 105 gr. bullet at 650 ft./sec. It will move under recoil like a real rifle! "Any 1897 Winchester pump in 12 gauge, original or replica. Civilian or Military style is allowed." This means the Norinco/IAC Trench gun is legal. If you find one cheap, call me. I'm looking for one. 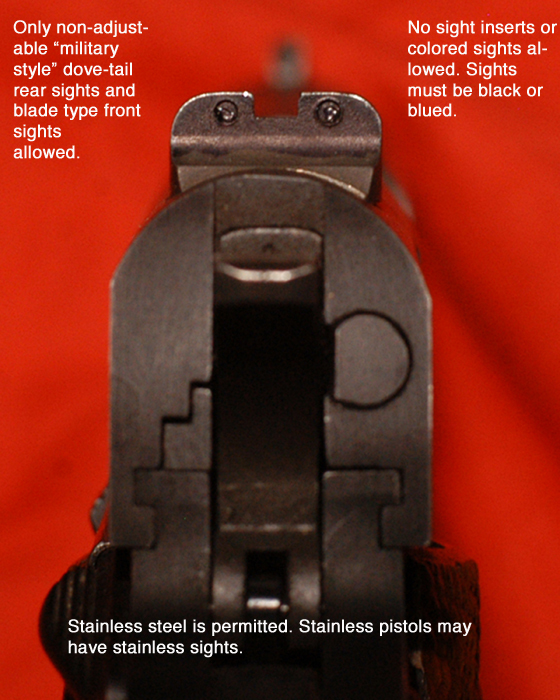 • Unloaded shotguns may be staged with the action open. 6 shot shotgun stages are popular. Some Winchesters will fit 6 in the magazine. Most will fit 5. There are 2 solutions to this, modify the gun to fit 6 rounds, which might require a gunsmith ($35 at Cowboys and Indians at EOT), or use B & P 2-1/2" shells. B & P 2-5/8" shells, available in 7/8 oz. and 1 oz. 1100 ft./sec. loads. 2 B & P 3-5/8" shells and 4 Remington STS shells will fit in "5 shot" magazine tubes. Shooters have more problems with 97s than the other guns. Some is self-inflicted, as they aren't used to actually working the pump action as John M. Browning intended. Many are because the guns haven't been competition prepped, and they don't work smoothly. Many are because they've been competition prepped—too far. Many are because the guns have been "rode hard and put away wet." Evil Roy says you need three, one to shoot, one at the gunsmith being fixed, and a spare.